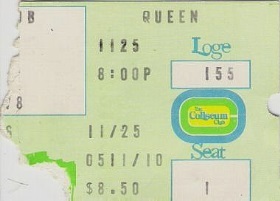 Queen are greeted with a rapturous applause after the first song. 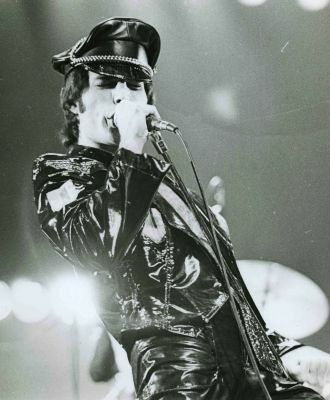 After greeting the people of Cleveland, Freddie exclaims, "We're gonna kill you tonight!" While introducing Somebody To Love, he says, "It's from one of the albums, I forget." After Brighton Rock, a couple fellows in the audience simultaneously shout (clearly rehearsed at some point) "White Man!" a couple times. Unfortunately for them, the band have dropped the song from the setlist for good. Freddie then tries to introduce the next song, but is interrupted by someone throwing an object of some sort onto the stage for him to wear. The singer says, "This looks ridiculous. I don't want it." He continues, "Ok, we're gonna do a brand new song right now. This has been released as our new 45. We have a double-A side. This is one side. It's dedicated to all you guys, all you chicks with big fat bottoms. 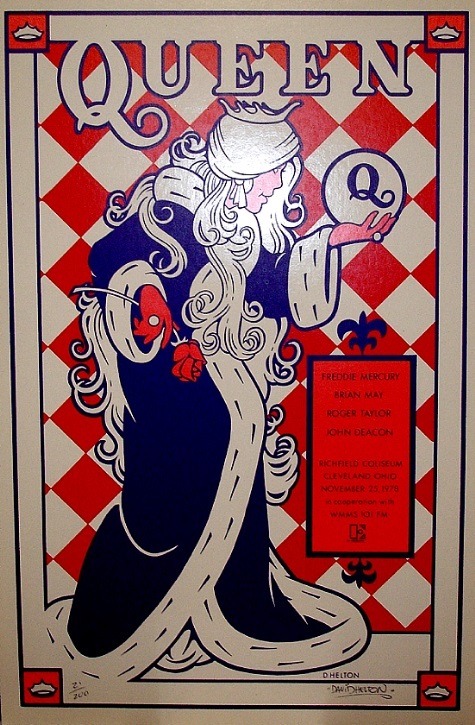 It's called Fat Bottomed Girls." Roger takes a couple extra bars to jump into the beat at the beginning of Keep Yourself Alive. 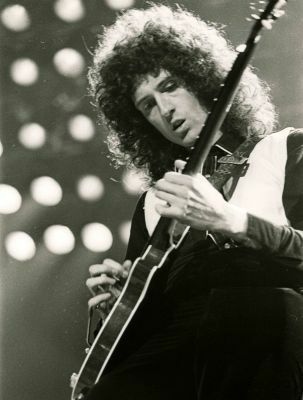 This is the first known occasion with Freddie being heard singing "I see a little silhouetto of a man" on the tape of the opera section of Bohemian Rhapsody. 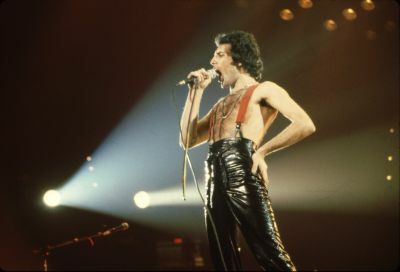 Previously, only the piano was heard at that point, while Freddie sang the line live back on the A Night At The Opera tour (with the exception of the Earls Court '77 shows). 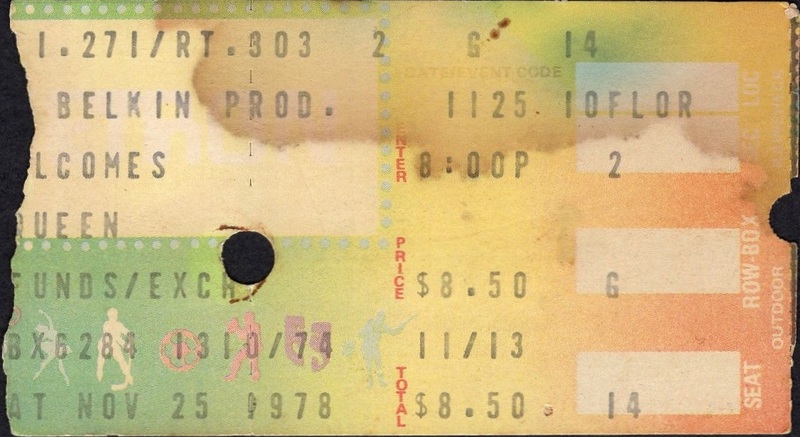 This tape would be played at every remaining Queen show (with one exception in 1979 where the old one was played by accident). 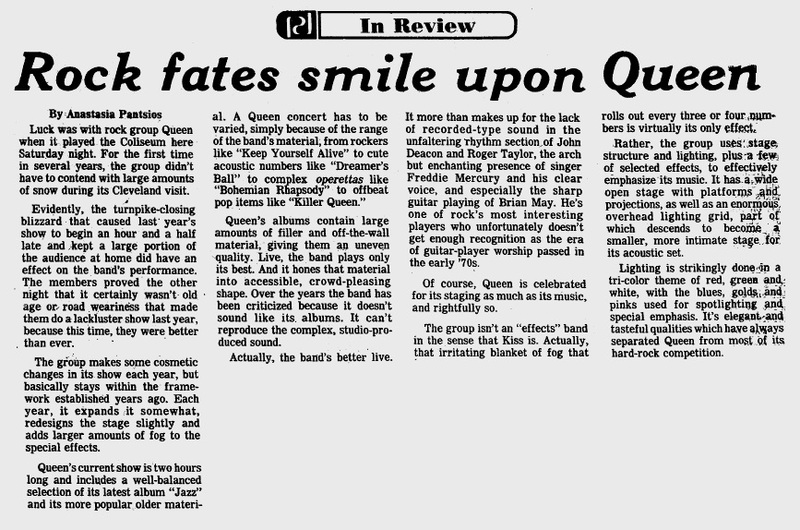 Here are two reviews of the show (1, 2), the second of which declares Brian May to be "the closest thing to Jimi Hendrix's innovation with guitar since Hendrix's death." The photos are © Janet Macoska. You can purchase prints of her fine work at http://www.janetmacoska.com (a few more are on display here). This fragmentary recording is all that is known to exist from this show.